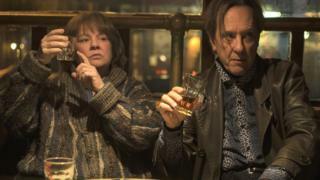 Richard E Grant stars with Melissa McCarthy in Can You Ever Forgive Me? Richard E Grant has received his first ever Oscar nomination, for best supporting actor for his role in the film Can You Ever Forgive Me? The Withnail & I star was among the first 2019 nominees to be announced, alongside Mahershala Ali, Adam Driver, Sam Elliott and Sam Rockwell. Rachel Weisz is up for best supporting actress, as are Amy Adams, Marina de Tavira, Regina King and Emma Stone. The nominations are being announced in LA and the ceremony is on 24 February. The main contenders are expected to include A Star Is Born, starring Lady Gaga and Bradley Cooper; Netflix’s black-and-white Mexican epic Roma; The Favourite, featuring Olivia Colman opposite Weisz and Stone; and Green Book, which explores racial tensions in the Deep South of the US in the 1960s. Watch the special Oscar nominations programme on the BBC News Channel below (UK only).